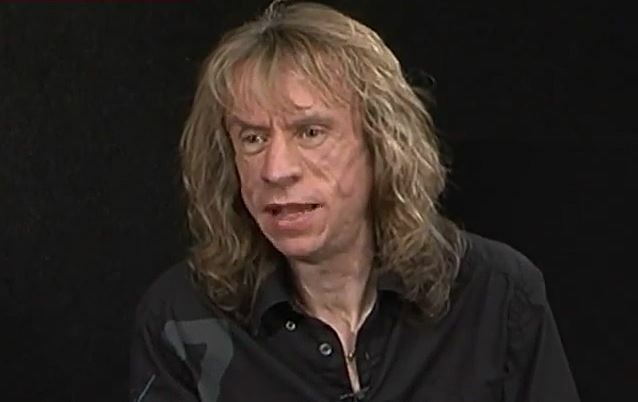 In a new interview with music writer Joel Gausten, guitarist Brian Tatler of New Wave Of British Heavy Metal (NWOBHM) legends DIAMOND HEAD discusses the band's 40th anniversary, their new self-titled album (released in North America on June 24) and their relationship with METALLICA, who have recorded and/or performed five of their songs over the years. An excerpt from the feature appears below. Perhaps the most thrilling aspect of the new album is the fact that DIAMOND HEAD are still very much in the game and remain part of a special group of NWOBHM bands active in the present tense. What does Tatler see as the reason behind that scene's durability after so many decades? "I think it was a generational thing," he said. "All us kids who were 16, 17, 18 had grown up listening to these incredible bands of the '70s — like BLACK SABBATH, [LED] ZEPPELIN, [DEEP] PURPLE, RUSH, AC/DC, THIN LIZZY - and that must've rubbed off on us. That was a fantastic period of music. "My favorite period of music is the 1970s, so I probably wanted to do something similar and give something back and take it forward. We were trying our best to compete and push forward, and I imagine a lot of the other bands all around the country — SAXON, DEF LEPPARD, you name it — were doing probably the same. A lot of us were aware of each other, but we were trying to make our way in the world. We'd got some stiff competition, because a lot of these bands are still going, of course. Like JUDAS PRIEST. You can go and see them at your local place of worship. I think the quality was there, and once it got established in Sounds and they got it on the front cover, I took notice and certainly thought, 'Wow! There's an opportunity here for DIAMOND HEAD to get signed.' We were formed in 1976; by '79 when it started happening, we were about ripe for something to come along and give us an opportunity to get heard [by] a wide audience." Of course, four of the guys in that audience were the original members of METALLICA, who covered four songs off DIAMOND HEAD's 1980 album "Lightning To The Nations" ("The Prince", "Am I Evil? ", "Helpless" and "Sucking My Love") at their early shows. This adoration carried into the studio, with their take on "Am I Evil?" appearing on both the 1984 "Creeping Death" EP and the Elektra Records re-release of 1983's "Kill 'Em All". Later, they covered "Helpless" on 1987's "Garage Days Re-Revisited" and "The Prince" for the B-side of the "One" single in 1989. In 1998, they released their rendition of another "Lightning To The Nations" track "It's Electric", on the double covers album "Garage Inc."
Not surprisingly, Tatler is quick to show his respect for the metal giants. "I'm full of admiration for what METALLICA have done," he says. "It's an incredible ride, I think. I've been to see them probably at least 20 times. To watch that band come from nothing to conquer the world and [be] the biggest metal band of all time is an incredible thing to see. To have met Lars [Ulrich, METALLICA drummer] when he was just a DIAMOND HEAD fan — and he never mentioned playing the drums or forming a band or anything — and watch him rise to the top and headline the biggest festivals in world is something I've never seen happen before or since to anyone I actually knew and could count on as a friend. That was unbelievable. Yeah, they were influenced by bands like DIAMOND HEAD and MOTÖRHEAD and MAIDEN and whatever back in probably '81, '82 or '83. But by the time 'Master Of Puppets' came out, I think they'd left that style and the New Wave Of British Heavy Metal influence probably behind, and they pushed into some new territory that no one had been before. Then everyone started copying them, and now there's 100,000 bands that sound like METALLICA." Read the entire interview at JoelGausten.com.